This story belongs to the category in which child readers delight in knowing what’s going to happen, and are gratified when it does. Knowing the ending means it’s no less of a surprise. Further to the metafictive nature of this picturebook, an ‘alternative ending’ is supplied, and it is explained that this has been added for the more sensitive readers. We are then treated to a classic cutesy happy ending, which pokes fun at the picturebook category in general. This will appeal to adult co-readers, who will have seen more than their fair share of picturebooks of the cutesy kind. I wonder when young children realise the joke. My six-year-old daughter was very, very taken by the fact that you can pull a little library card out of the rabbit’s library book. Later, she is equally impressed at being able to pull an overdue library notice out of an envelope which has been stuck down to the final page. This particular copy is from the university library rather than the local library, in which case any sort of paper engineering tends to get mangled. (The university’s collection of picturebooks, in contrast, seem to be most utilised by adults rather than their kids. No food stains, taped-up pages or scribbles have been found yet.) I did have to explain to my daughter what a library card and an overdue notice is. Although published in 2005, this book may stand as a historical artifact in a world where books are checked-out digitally and overdue notices are sent electronically. Even the postcard illustration, adding interest to the colophon, is something young readers may not have much experience with. This book is a snap shot into the past. These things may need to be explained to young readers. What makes this rabbit so darn cute? I think it’s mostly in the very expressive ears. One sticks up and one flops over, in the teen-romance equivalent of a lopsided smile. Ears pointing toward the book show rabbit’s intense concentration. Ears pointing straight back show rabbit’s mortification. One ear loops round to resemble a question mark at times. On the cover, the rabbit looks small and inquiring, and looks with interest up at the title — an echo of the interest in the child readers themselves, looking up in the world, trying to figure it out. 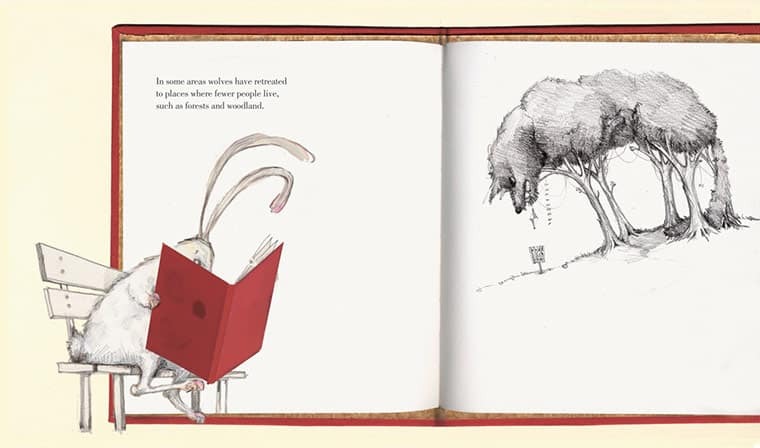 As rabbit walks along while reading, oblivious to its surroundings, the young reader sees that the grass is actually a wolf’s fur; rabbit is coming to the end of wolf’s snout, and wolf is holding cutlery. There are allusions here to The Gingerbread Man. Earlier, the wolf in a hood is reminiscent of Little Red Riding Hood. In fact, the whole story relies on the classic fairytale idea that rabbits are cute and good; wolves are evil and sneaky and bad. The reader’s comprehension of this story hangs on understanding that rabbit is reading a book within a book. 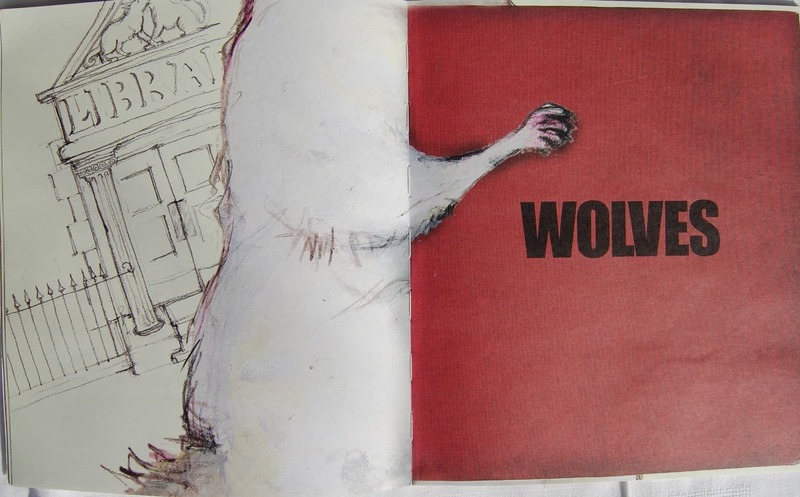 To achieve this, the book replicates the half title page — which is red with the single word ‘Wolves’. 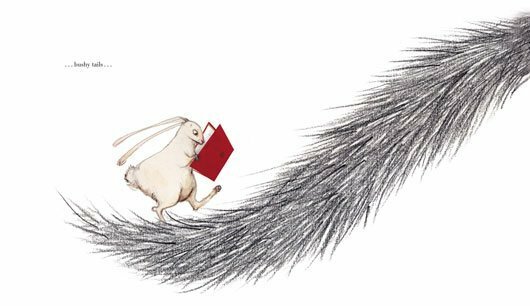 We then see an extreme close up of rabbit clutching a book, advancing towards the reader with a library in the background. Interestingly, the rabbit’s head has been cut off. This helps set the ominous tone. White space is used both within the fictional book and in the actual book. The reader can’t be distracted. Our eye is guided straight to the critical spot on the page, in this case to a clump of trees that — to the rabbit — now look like a big wolf. 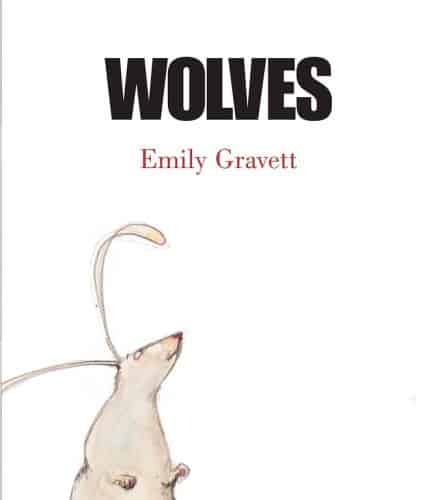 Is this the illustration within the book, or is rabbit now looking around its own environs, seeing wolves everywhere? Rabbit spans both the main frame and the embedded one. Which world is rabbit in? The colour palette is limited and red is, of course, symbolic. 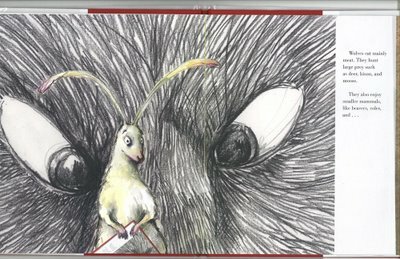 When the rabbit supposedly gets gobbled, the reader sees only the red, scratched-up, photo-realistic cover of the rabbit’s book. 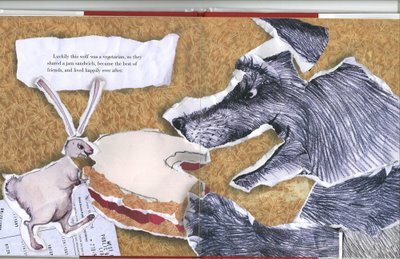 The jam sandwich shared by rabbit and wolf in the ‘alternative ending’ is made out of scraps of torn out paper. This is wonderfully funny because the astute reader will see that it’s not a fictionalised ending at all. 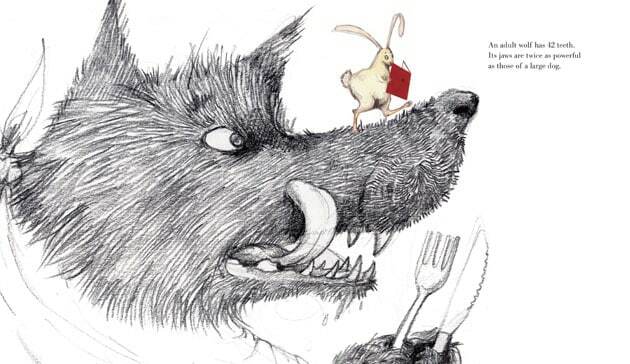 Did the wolf really eat the rabbit in the world of the story? We never really know. Bronze award winner of the Nestle Children’s Book Prize 2005. (The Nestlé Children’s Book Prize, and Nestlé Smarties Book Prize for a time, was a set of annual awards for British children’s books that ran from 1985 to 2007. So this won in the second to last year of the prize.) Although I’m sad that this prize no longer runs, I don’t like to see highly sugared and processed food associated with children’s products. Almost square in size — slightly higher than it is wide — medium size. 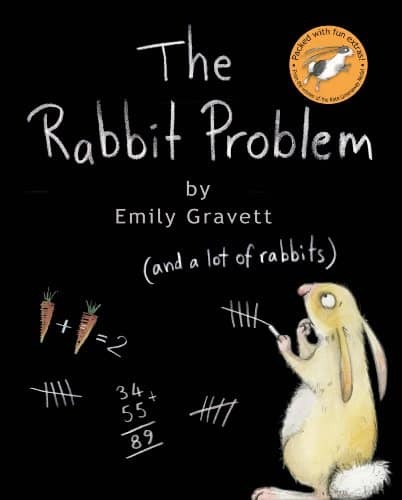 Another beautifully produced book about rabbits with impressive pop-up engineering (and a surprise on the last page) is The Rabbit Problem, also by Emily Gravett. 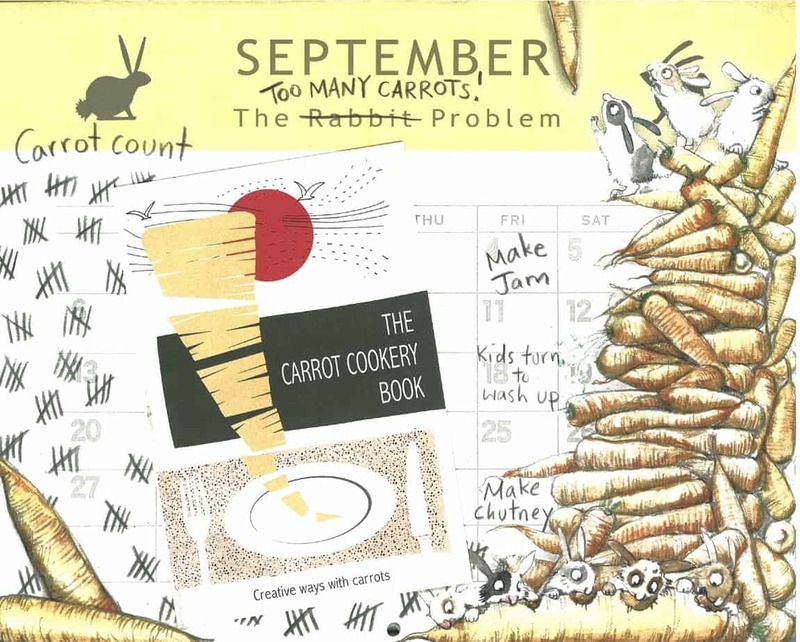 Each page is a month of a rabbit’s calendar (anthropomorphised). Again, the book is full of mock-copy such as rabbit cookbooks, rabbit newspapers and so on. Most of the text is found within these artefacts. 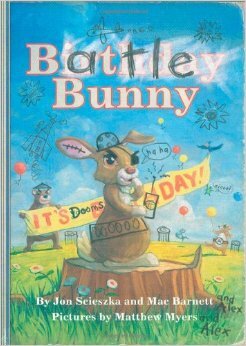 Then there’s Battle Bunny, for another example of metafiction which pokes fun at picturebooks in general. It seems rabbits are an excellent choice for picturebook parodies, probably because they’re so ubiquitous and also because they’re inherently cute, furry and helpless, lending themselves to cutesy stories. 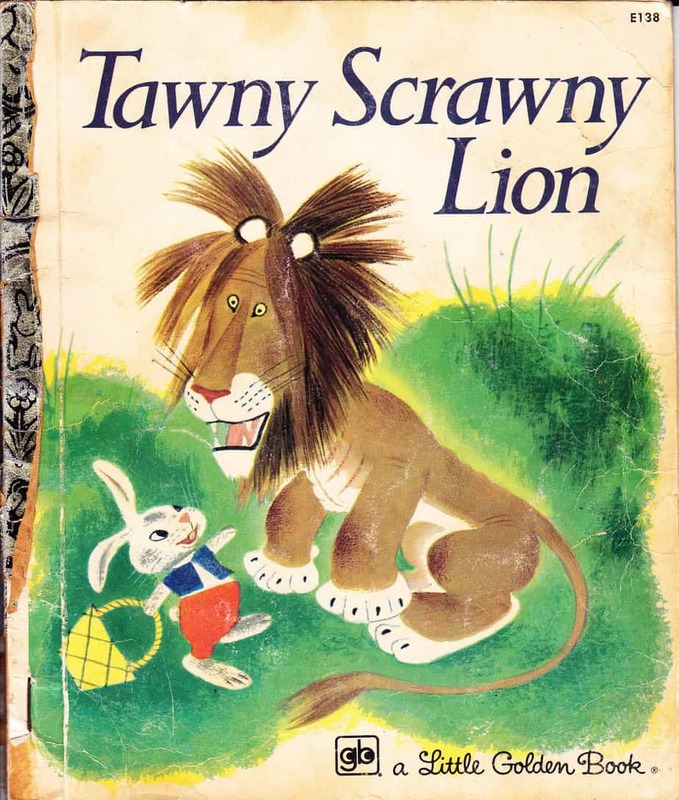 The Tawny Scrawny Lion is an example of a classic picturebook in which a carnivorous animal turns vegetarian for narrative purposes. Sure enough in Wolves, the alternative ending has the wolf sharing a jam sandwich with the rabbit and becoming best of friends. Next PostNext Is there an essential self?